Holy cow. When I finished book one, I wasn't sure I could read the next book. When I finished book two I thought there was no way my mind could handle book three. Yet here I am, just a few hours after finishing book three and I'm enthralled (again), entertained and wondering if there is something wrong me with because I keep coming back for more, heartbroken(afreakingain) and terrified of book four. Judge of Hell is no less powerful and captivating and sad and terrifying as Trouble in Hell and Bittersweet Hell. We pick right back up post JW and Eden's story and there are SO MANY twists and turns. I can't say a lot about Judge's story because that would be spoiling it but I'm going to say this - Alex continues to leave me in awe. She takes the most horrifying and gives it a bittersweet ending. She breaks(or tries to) her characters and then shows their strength by giving them the opportunity to grow and be successful and by Malus standards normal thriving people. Except Emo, he's still as whacked out and destroyed as before but... There's the tiniest glimmer of hope for him in this book. 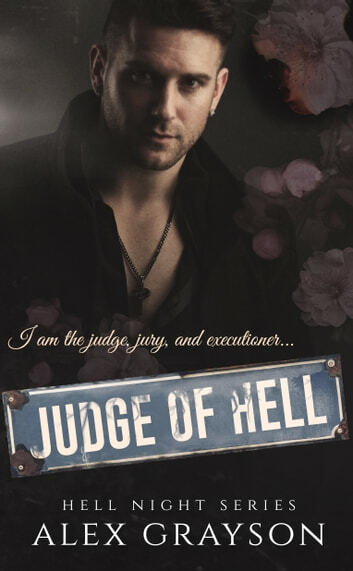 If I could unread Judge of Hell and re read it I don't know if I would love it anymore than I do. I wish I had the ability to put into words how hard I love this series and every ounce of heart and heartbreak Alex has put into it. I'd say Judge will be hard to top but come on... We all know Emo's book is gonna knock his brothers out of the water and leave us devastated. Congratulations Alex on another book that is beyond my expectations.